HRW: US, EU "treating war crimes with kid gloves"
The UK, France, and Germany, made no comment about the report, and a Swedish ambassador to the UN said the report was credible, but did not endorse action that would see the conclusions of the report brought to fruition. "The US effort to dismiss the Goldstone report was downright shameful for an administration that claims to promote the rule of law and accountability for war crimes," said Juliette de Rivero, Geneva director at Human Rights Watch. "It was also deeply disappointing that key EU governments did not seize this valuable opportunity to demand justice for victims on both sides of the conflict. The report's detailed findings and its careful recommendations deserve support, not dismissal and silence." United Nations, Geneva, 29 September 2009 - The Human Rights Council discussed on 29 September the report of the Fact-Finding Mission on the Gaza Conflict, hearing a presentation by the head of the Mission, Richard Goldstone, statements by Israel and Palestine as concerned countries, and then holding an interactive dialogue with the Mission. Following that presentation, Richard Goldstone and other members of the UN Fact-Finding Mission on the Gaza Conflict holded a press conference. Palestinian support for Justice Richard Goldstone’s call for further investigations into allegations of war crimes committed during Israel’s war on Gaza last winter is overwhelming. In dozens of interviews with ordinary people, civil society activists, and political figures of all stripes, Ma’an did not find a single person opposed to Goldstone or his time, aside from minor critiques of the report. Goldstone, a Jewish South African judge, presented his team’s findings to the United Nations Human Rights Council in Geneva on Tuesday. Ultimately, the report will need the backing of the Security Council to be referred either to the International Criminal Court or to a possible special tribunal similar to those established for Rwanda and the former Yugoslavia. Salah Samouni, 31, who lost 29 of his relatives to the Israeli onslaught in January, is one of the people who testified to Goldstone’s United Nations Fact Finding Mission when it visited Gaza. His family was massacred when Israeli soldiers herded nearly 100 of his relatives into a single building and then shelled it. Samouni said he supported the investigation. “If you watch foreign or Indian films, people who are oppressed at the beginning usually get their rights at the end. If we don't get our [financial] rights, we will be living in a jungle, survival of the fittest.” he told Ma’an. Although he hadn’t read the 574-page report he said that he found Goldstone’s team to be professional and thorough. “After everything that happened, we still want to know why. We are civilians. There was no resistance in this area. … Give us a reason,” he said, standing on the ruins of his cousin Wa’el’s house, the same house where members of his family were killed. “The team was very well composed, very professional,” he said of Goldstone’s commission. Ahmad Yousef, an advisor to Prime Minister Ismail Haniyeh of the Hamas-led government in Gaza, said that the report, by putting Israel and Palestinian groups on equal footing, was unfair. “The report tried to equate, in one way or another, between the aggressors and the victims. That is actually where we are not satisfied totally with the report,” Yousef said in an interview at his home in Rafah. On the opposite side of the Palestinian political equation, a Fatah-affiliated member of the Palestinian Legislative Council (PLC), Faisal Abu Shahla, said he also met the Goldstone team and found them to be “fair,” but leveled the same critique that Hamas did. “They were talking about Israeli crimes in Gaza. But they were not fair when they compared the Palestinians’ resistance to the people that were attacking them and occupying their land, making a balance between them,” said Abu Shahla. Lawyers representing Palestinian families are seeking the arrest of Israeli Defense Minister Ehud Barak for alleged war crimes in the Gaza Strip, Al-Jazeera reported Monday. A lawyer working for the families told the news network he will present their case at a magistrate’s court in London on Tuesday before British officials decide if it has the jurisdiction to decide the case. Barak is due in Britain on Tuesday to address a meeting of the Labor Friends of Israel on the sidelines of the ruling party's annual conference in the city of Brighton. The families hope that an arrest warrant will be issued during his visit, Al-Jazeera said. Michel Massih, the UK-based lawyer who is filing the case, said that he believed that the British government was obliged "to actively pursue people who are alleged to be involved in war crimes." "One does not need, at this stage, to provide more than a basic prima face case and the suggestion would be that Barak certainly was in a position where he has to answer some of the allegations made about the commission of crimes by Israeli troops," he told Al-Jazeera in a televised interview from London. According to international, Israeli, and Palestinian human rights groups, more than 1,400 Palestinians, at least one third of them women and children, were killed during Israel’s Operation Cast Lead against Gaza last December and January. Also on Tuesday South African Judge Richard Goldstone is slated to present his 574-page report, the result of his fact-finding mission to Gaza, to the United Nations Human Rights Council. 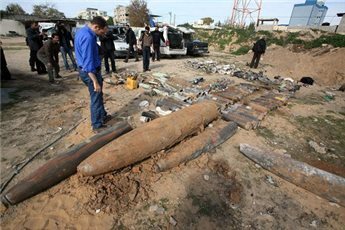 The report found that both Israel and Palestinian armed groups had likely committed war crimes, and called for further investigations. "If the Israeli courts were themselves to investigate, there would be no need to have recourse to international tribunals," Massih told Al-Jazeera. Anti-occupation campaigners, meanwhile, are planning demonstrations outside the conference hall during Barak’s visit. “The presence of Ehud Barak in Brighton while Britain’s party of government is meeting is a disgrace. In January the people of Britain protested in hundreds of thousands at the massacre in Gaza which Barak, Israeli Minister of Defense, had ordered his armed forces to carry out,” said Betty Hunter, the general secretary of Palestine Solidarity Campaign, in a statement. In 2005, human rights groups criticized UK authorities for failing to arrest Doron Almog, an Israeli army general when he landed at London’s Heathrow airport, in spite of an outstanding arrest warrant for alleged war crimes. According to Al-Jazeera, Almog was allow to stay on his plane after apparently being informed that he could face arrest, and was allowed to return to Israel. A lack of accountability for war crimes committed in the Middle East is undermining any hope for peace in the region, Justice Richard Goldstone, told the UN Hman Rights Council Tuesday. "A culture of impunity in the region has existed for too long," Goldstone, the author of the report, a former UN war crimes prosecutor and Jewish South African, told the UN Human Rights Council in Geneva, was quoted by Reuters. "The lack of accountability for war crimes and possible war crimes against humanity has reached a crisis point; the ongoing lack of justice is undermining any hope for a successful peace process and reinforcing an environment that fosters violence," he continued. According to international, Israeli, and Palestinian human rights groups, between 1,100 and 1,500 Palestinians were killed during the attack Israel dubbed Operation Cast Lead. Nine Israelis, including three civilians, were killed, plus four who were killed by friendly fire. Goldstone urged the 47-member state body to adopt his report which found that the Israel military and Palestinian fighters both committed war crimes during the attack. According to the Associated Press, a resolution to endorse the report and its call to have the war crimes instigated by the International Criminal Court is supported by Arab states but opposed by Europeans and the US. Palestinian and Israeli officials are slated to address the Council during a full day of debate on Goldstone’s findings later Tuesday. A Human Rights Council vote later in the week will be a first major test for the report. Ultimately, the report will need the backing of the Security Council to be referred either to the International Criminal Court or to a possible special tribunal similar to those established for Rwanda and the former Yugoslavia. The incidents of Israel’s twenty-two day war on Gaza war have been the focus of commentators, publicists, and national and international politicians. Many are trying to clarify issues around legal accountability in response to war crimes allegations. The disagreement between parties over the culpability of sides for the devastation of the war should have become clear on 15 September 2009 when Richard Goldstone published the findings of the United Nations Fact Finding Mission on Gaza Conflict. As a basis for its work, the mission considered only actions classified as violations of human rights and/or humanitarian law by all state parties (par.11), including the United Nations Charter, international law, international human rights law and international humanitarian law (par.15). The mission relied mainly on first-hand accounts, generally understood to be “highly-credible” sources of information (par.24). The field workers collected detailed information despite total Israeli non-cooperation (p.558 of the report). The mission took a broad look at the war, investigating the then two-year Israeli blockade of the area as well as interviewing residents of the Israeli town of Sderot, a target for many of the projectiles launched from Gaza. The report’s findings dealt with both Palestinian and Israeli stresses and causalities. On the Palestinian side the key findings were as follows: 1,300 killed during the war, a deliberate destruction of public buildings, killing of policemen (par. 33, 34), at least 13 incidents where Israeli forces targeted civilian deliberately (par.37), the refusal of the evacuation of wounded civilians (par.43), deliberate attacks against mosques during prayer (par.43), the use of white phosphorous missiles in built up areas causing ‘untreatable’ burns (par.48), and a collective punishment of civilians for the capture by militants of Israeli soldier Gilad Shalit (par.78). On the other side, as a consequence of the projectiles fired by Palestinian armed groups, 3 Israelis were killed and 918 Israeli civilians were physically injured in the year preceding the declaration of war, another 82 were injured during the war (par.104). Approximately 50 percent Sderot residents suffered Post-Traumatic Stress Disorder (par.105) [no number for PTSD suffers in Gaza was given], and the Sderot economy was stifled (par.107). In response to all these violations of international human rights and/or international humanitarian law standards, the Goldstone report recommended investigations be carried out in each region to ensure that those who violated rights were held accountable. The report said the Israeli military report that found “throughout the fighting in Gaza, the IDF [Israeli military] operated in accordance with international law” to be inefficient (par. 119). The report concluded that there was no legal infrastructure for such an investigation in Gaza. Given the inability of both sides to conduct a full investigation of the incidents, and that the crimes were violations of international criminal law, the report suggested the investigations be conducted by the International Criminal Court. The Goldstone report said the ICC could be, at least theoretically, a competent authority over the crimes given its historical role in the enforcement of International Humanitarian Law as well as International Human Rights Law, the Rome Statute of the International Criminal Court, in particular article 8 (2) (a ) (“grave breaches”) and 8 (2) (b) (“other serious violations of the laws and customs applicable in international armed conflict”) (par.290). The report also found that the ICC could ensure accountability for its findings. Israel, however, is not a member of the International Criminal Court, so the body cannot bring the case forward without the agreement of the government. International war crimes prosecutor Luis Moreno Ocampo explained that his court lacks the jurisdiction to investigate possible Israeli war crimes in Gaza. Nonetheless, Palestinian human rights organizations have called for UN Secretary General Ban Ki Moon to request that the Security Council order the Court to open such an investigation. This is the only other option for bringing a case forward in the body, since it is not likely Israel will agree to come forward for the case of its own volition. The worry, of course, is that a member of the Security Council, likely America, would veto the request and prevent the body from ordering a case. On Sunday night, the Jewish community began our annual Yom Kippur fast. The physical deprivation is a crucial element of the day, but as with many faith traditions, the fasting itself isn't really the point. Going without food and water is, rather, a device, intended to sharpen our senses and lead to reflection. This reflection is notably, pointedly, not a personal pursuit. All through the Yom Kippur prayers, we're called to do "cheshbon nefesh," a moral accounting, as a community: "We have sinned," we pray. "Forgive us." But though the rituals are ancient, they're never far removed from modern life. Between our prayers, Jews are sure also to discuss the current events that touch our community most deeply: the prospects for Israeli-Palestinian peace, US President Barack Obama's recent meetings with the leaders of Israel and the Palestinian Authority, and the United Nations' recent Goldstone report, in which both Israel and the Hamas government are accused of war crimes. To my great sorrow, however, many in the Jewish community have already rejected the latter out of hand. Rather than jointly consider Israel's acts in Gaza, carry out real cheshbon nefesh, and accept our communal responsibility, it has proven easier for many of us to employ communal defense mechanisms, and insist that in this particular case, there's no need for reflection. Since the report's publication, the UN and commission chair, justice Richard Goldstone, have been vilified and disparaged, by both the Israeli government and certain Jewish leaders. There has been little consideration of the actual findings, or the fact that Israel refused to cooperate with the commission, or conduct its own investigation. As a rabbi, this grieves me deeply. For, painful as it is for us to admit, Israel's behavior in Gaza has consistently betrayed our shared Jewish ethical legacy. This was true before the war, when the Israeli blockade denied Palestinians basic necessities; it was true during the war, when Israel responded with disproportionate force to Hamas projectiles; and it has been true since the war, as Israel has deepened the blockade, preventing Gazans from rebuilding their homes. As a result of Israeli actions, some 60 percent of Gazans don't have continual access to water and face near-daily power outages of up to 10 hours at a time, while hundreds of thousands are dependent on foreign aid agencies for food. A humanitarian crisis of this magnitude demands a response from within the Jewish faith community - and knee-jerk rejection of any and all criticism of Israel won't change the facts. It will only distance us from a just and peaceful solution to this conflict. I don't mean to suggest that the report is perfect. No human endeavor is. Evidence of bias in the commission's make-up is important, and should be honestly addressed, as the White House has suggested. But to categorically reject the Goldstone findings - which echo the work of highly respected Israeli and international human rights groups such as B'tselem and Human Rights Watch - is to thrust our heads into the sand. In the end, the report's most critical recommendation is that Israel and Hamas thoroughly and credibly investigate themselves, and hold accountable any combatants or commanders who violated the law. The actions of Israel ultimately reflect upon the Jewish people throughout the world. We in the worldwide Jewish community have long taken pride in the accomplishments of Israel. As with any family, the success of some reflects a warm light on us all. But pride cannot blind us to the capacity for error on the part of the country we hold so dear. We cannot identify with the successes, but refuse to see the failures. As we approach Yom Kippur, I call on Jews to examine the Goldstone findings, and consider their implications. In the spirit of the season, we must consider the painful truth of Israel's behavior in Gaza, and understand that we must work, together, to discover the truth - and then urge on all relevant parties in the search for peace. Every Yom Kippur, we read the words of the prophet Isaiah: "Is such the fast I desire, a day for people to starve their bodies? ... No, this is the fast I desire: To unlock the fetters of wickedness and untie the cords of the yoke, to let the oppressed go free." Let this be the Yom Kippur on which Jews choose not just to starve their bodies, but also to unlock the fetters and untie the cords - let this be the Yom Kippur on which we act on the scriptural imperative to "seek peace and pursue it," by calling ourselves and Israel to account. Brant Rosen is the rabbi of the Jewish Reconstructionist Congregation in the American city of Evanston, Illinois and co-founder of Ta'anit Tzedek: Jewish Fast for Gaza. The Fatah-backed Palestinian Authority in Ramallah has condemned Sunday’s Israeli infringement on the Al-Aqsa Mosque Compound in Jerusalem and hailed Palestinians who rushed to defend the holy site. In a statement issued on Monday evening, the cabinet of caretaker Prime Minister Salam Fayyad also urged Arab and Muslim countries to mobilize in defense of Al-Aqsa. The Council of Ministers of the government also denounced the Israeli police for entering the courtyard of the mosque and “attacking worshippers,” injuring some of them. The cabinet said that the incursion was linked to Israeli plans to expand settlements around Jerusalem and confiscate more Palestinian land, consolidating their control over the city and negating Palestinians’ ability to make the city the capital of their state. The council said that such actions by “Israeli extremists” has led to increased tension, and called for the international community to take action. In its statement the cabinet also urged the United Nations Human Rights Council to act to implement the recommendations of the report by Justice Richard Goldstone on alleged war crimes during Israel’s war on Gaza last winter. The statement also thanked donor states for providing an additional 400 million US dollars to cover the deficit in the PA budget over the next four months.